Happy new year and welcome to all our customers and friends! At Lucy Erridge we want to keep you updated on our news so here we go! In preperation for the new year and to do some necessary renovation work in the shop we will close for a period of time in the month of February. In the new year we will be introducting many new and exciting things, exclusive to us, designed and made by us and also by local talented artists and craftspeople. 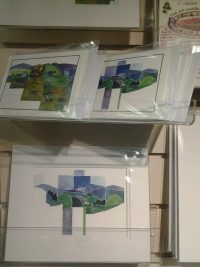 We are delighted to launch a new range of cards and prints featuring the original artwork of Alison Erridge – Lucy’s mum. Alison has been working hard all winter to bring this beautiful collection together and you will not be disappointed. Along with the range of cards and prints, we have extended Alison’s drawings on to a choice of other new products such as coasters, place mats and pottery. 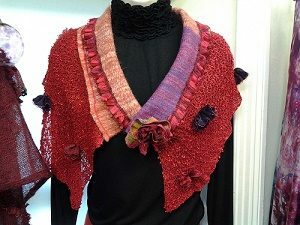 Another addition to our original pieces this year, will be the latest inspirational designs in knitwear by Lucy Erridge herself. Lucy uses the finest quality yarns to bring you something truly special, and this year she has extended the collection to include a cotton/linen range, keeping in mind anyone who has a problem wearing wool or mohair. In addition to all of these new products for 2017, we also have an extensive selection of luxury alpaca knitwear, handpainted silk scarves, leather goods, jewellery and accessories. Unusual textile pieces and handpainted glass also feature amongst the more unique items you will find at Lucy Erridge, all created by local artists and each piece a “one-off”. Whatever the occasion in the new year, be assured you will find the solution to your quest for that “something different” amongst the varied collection we have to offer. We look forward to seeing you and being of assistance!